This beauty boasts a luminous rosecut moonstone and a lovely round Welo opal. All sterling silver & one of a kind. 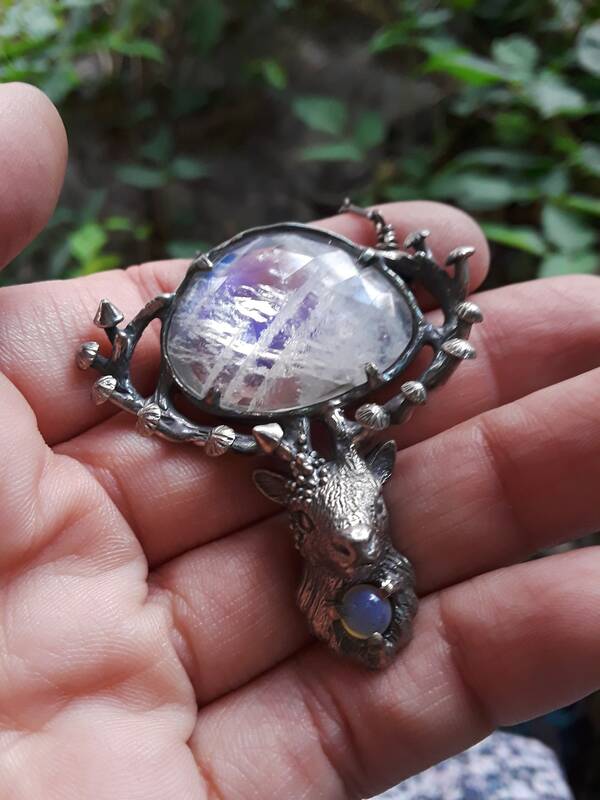 My never ending army of spirit deer forest familiars is back for round two in 2018! This stunner captivates with a green included lodolite and adorned in the signature hyper-detailed style of Freyja Jewels. 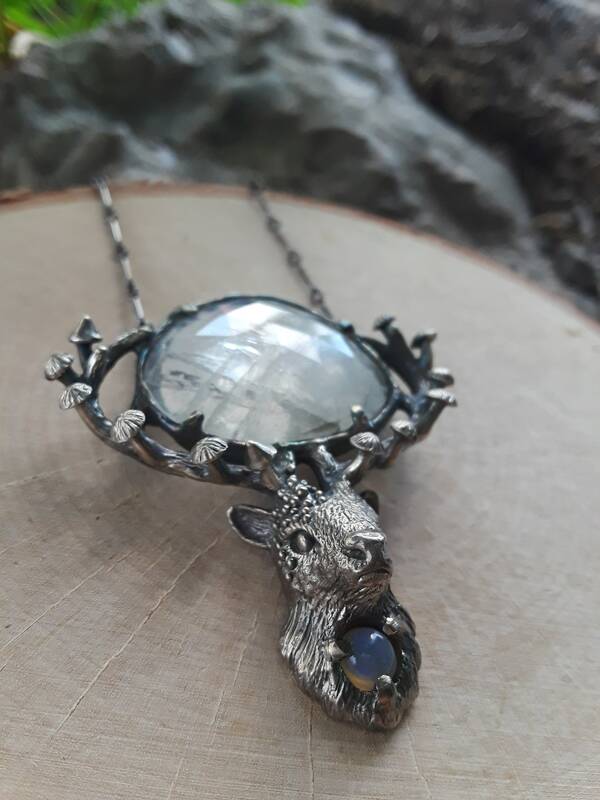 This deer has a butterly for a passenger on his chest! 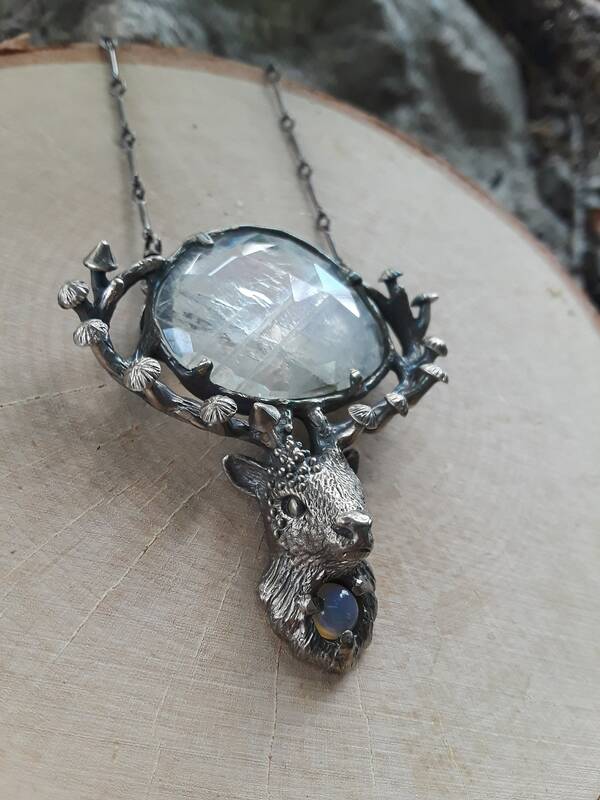 Each setting is hand sculpted in wax around the stone and then cast in solid sterling silver and oxidized and polished once more to better reveal the many tiny details of your piece. 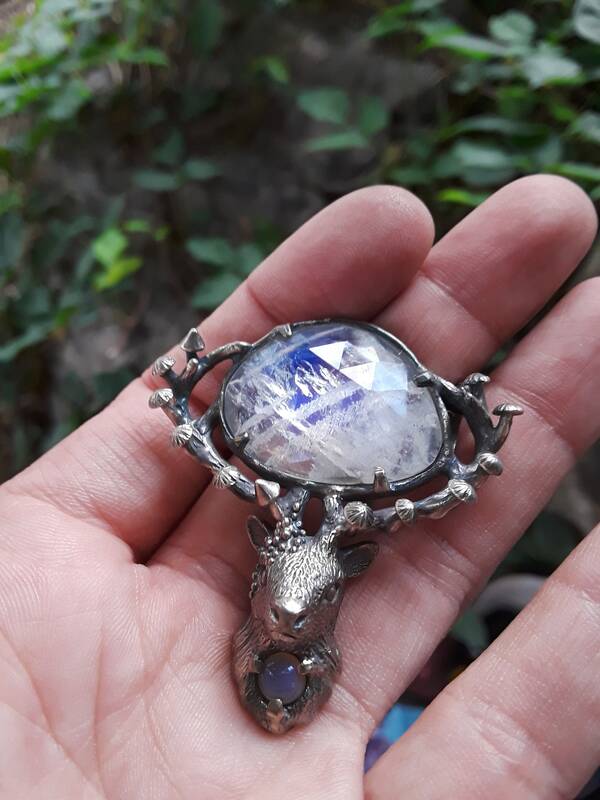 In Freyja Jewels signature woodland baroque style, where more is MORE and each one of a kind piece just might be your portal down a dark and twisty fantasy forest path where the fungi spirits blow whispers of spores to alert the forest guardian deer spirits of a strange presence visiting... ...or perhaps it is just a relic from such a place..? We may never know! 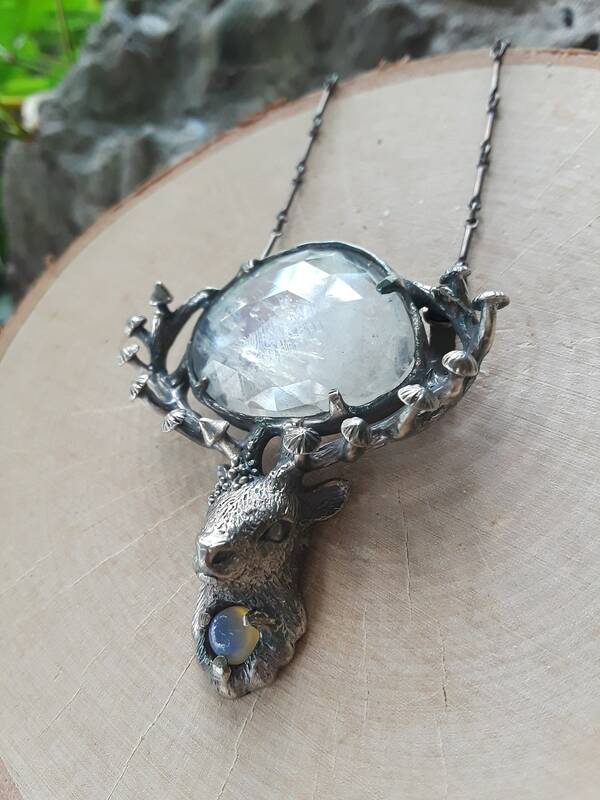 In the meantime, such a magical handmade talisman can be yours...! 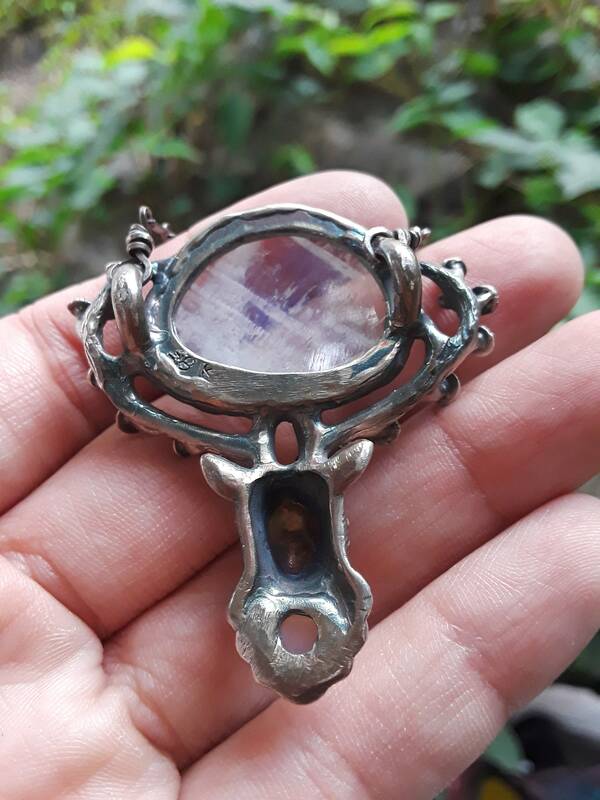 Dimensions: The pendant is approximately 2.25" tall and 1 3/4” wide and hangs on an 18"-20" adjustable sterling silver chain and has a lobster claw clasp. 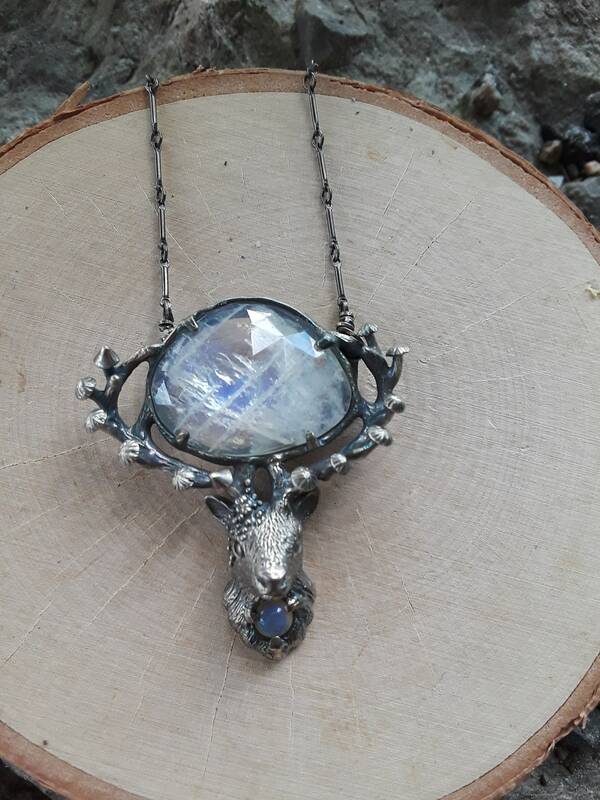 Take a look at our other mystical wares.. This piece is an original design and is protected by Copyright laws. Copyright © Katya Pride, Freyja Jewels, 2015-Present. We accept major credit cards with Etsy Direct Checkout. We also accept Etsy Gift Cards via Direct Checkout. If you need alternative payment methods, contact us to see if we can work something out. If payment is not received within 24 hours, your purchase will be canceled and removed from our records. Once your order has shipped, we will send you a note of confirmation via Etsy. U.S. customers should expect to receive their item between 3-5 days from date of shipment. International customers can expect to receive their order between 10 days-2 months in extreme cases and usually dependent on your country's custom laws. We ship all of our work securely via USPS priority mail services. This includes tracking, but does not included insurance. If you would like to purchase insurance, please email us prior to purchase and we will set up a custom listing for you. If during the turn around time you decide you would like to add insurance, please contact us and we will set up an option of payment for this additional fee. Please understand if you decline to add this service and your package is lost, stolen or damaged due to USPS or other factors out of our control, please know we are not responsible. We are very firm on this policy. Insurance protects your purchase should any of these fates befall your package once it's left our hands. We highly recommend it. We ship via first class mail via USPS. This includes a customs number that tracks your package to the U.S. borders but not beyond. We are happy to add insurance, which also includes express services to your order for an additional fee, please contact us before purchase and we can set up a custom listing for you that includes this protection. If during the turn over time you decide you would like to add insurance, please contact us and we will set up an option of payment for this additional fee. Every country's import taxes (and or) duty fees are different and it is your responsibility alone to be aware of your own country's custom laws as well as your responsibility to pay the additional taxes & duty fees that goes along with importing merchandise from the U.S.
Falsifying shipping documents is illegal here in the U.S. so please don't ask us to add a lesser value to these documents than what the piece is actually worth. Again, please note that we are not responsible for items that are lost, stolen or damaged that were not purchased with insurance. We are very firm on this policy. We do not accept returns nor issue refunds. Much of our work is made to order. Think carefully about your purchase before buying. Rings are custom made to fit your finger, make sure you send me the right size. If you need help with sizing, let us know & we will help you. We take quality pictures of our work and provide accurate descriptions for your consideration. If you have further questions, don't hesitate to ask. Please know we are very firm on our refund policy. Make an informed purchase by carefully reading through our policy section as well as by asking us any questions you may have about an item before purchasing it. We want you to love your new purchase. Should you have any concerns once you’ve received your order, please contact us immediately. We will work with you to find a resolution. We are understanding people who will treat you with respect. We ask the same in return. Please note that oxidation/patina is not permanent. However, with a little extra care, your oxidized pieces can retain their coloring for years. As with all jewelry, it's best not to wear your new piece while bathing, swimming, washing dishes or anything else that involves submerging the piece in water. We also recommend that you not sleep in your new jewelry. Please contact us for details regarding wholesale orders. We also do custom order.